I usually do a Monday Meme, but I thought this was too good an image to wait, lol. 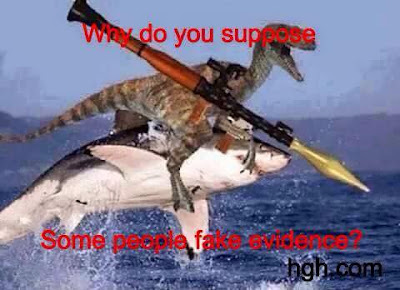 And, it asks a very valid question in the paranormal community: "Why do some people fake evidence?" There's no real right or wrong answer. People are weird and they do weird things, sometimes for no explanation at all. However, I've personally found that there are a few more prominent reasons why people tend to fake paranormal evidence. 2. Sadly, some do it to mock us in the paranormal field. People like to feed off that gullibility that I mentioned in reason number one, and then get their kicks by proving everyone wrong. So, they manufacture 'evidence,' pass it off as real, and after an appropriate amount of oohing and aahing, drop the hammer and let everyone know they faked it. Unfortunately, these types of people often succeed in blemishing the paranormal community's reputation. I've seen countless articles about photos and videos being examined by paranormal 'experts,' only to be proven fraudulent later on. While we know that there really is no such thing as a paranormal 'expert,' it gives the impression that all of us in this field lack the scientific aptitude to come to logical conclusions. Thankfully, there aren't too many people out there actively faking evidence. More often, you'll see people submitting fraudulent 'evidence,' mainly ghost app photos, simply out of ignorance. They may have found the image online and are looking for opinions, or they have been the victim of an innocent prank by a family member or friend. And, the majority of bad 'evidence' being submitted is still just ol' fashioned misidentification of natural phenomenon! Oh, and a quick pet peeve: 'Photoshop' is a brand name. Not every image that is digitally altered is 'Photoshopped, ' especially those that are the result of smart phone apps. Therefore, I prefer to just use the term 'digitally altered' (despite the name of this post) IF in fact it was digitally altered. Well before digital photography was a thing, there were ways, such as the burn and dodge technique, of altering film images.